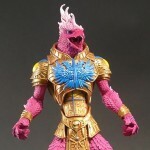 The Four Horsemen are at Powercon this weekend, and they are bringing one of a kind Gothitropolis figures done up to look like classic MOTU fowl. They are hand painted prototype figures done to look like Zoar, Screeech, and Glory Bird. These will be up for auction with proceeds going to charity at Powercon. Check out pics of the one offs after the break, along with reference shots of the original characters.